Welcome to Old English Jewellers - Uk. Established family run jewellers with over 12 years of Experience. 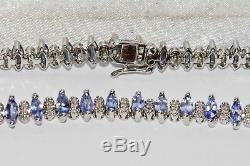 9ct Gold Tanzanite & Diamond Ladies Bracelet. Excellent condition - No Damage or wear. Hallmarked for solid 9ct gold. Length of bracelet - 7.5 inches. Weight of Bracelet - 12.4 grams. Maximum width of bracelet - 6mm. Each Tanzanite measures 5mm x 2.5mm, Each diamond measures 1mm diameter. Stones are excellent Quality &. Have been tested to confirm they are Natural. Please do not Hesitate to contact me if you require any further Information or have any problems. All Weights & Measurements are approximate. 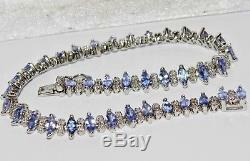 The item "9ct White Gold Tanzanite & Diamond Ladies Tennis Bracelet" is in sale since Saturday, June 23, 2018. This item is in the category "Jewellery & Watches\Fine Jewellery\Fine Bracelets\Diamond". The seller is "oldenglishjewellers-uk" and is located in BIRMINGHAM. This item can be shipped worldwide.